Illustration of John Chapman from Harper’s Monthly. 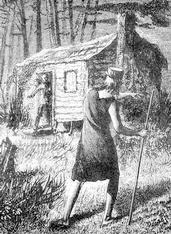 Think back to when you were a child and first heard the story of a man named Johnny Appleseed. No doubt your teacher told you that he was a poor hobo who wandered all over the midwest planting apple trees as he went. You probably remember that he wore a pot for a hat, that he “never killed a living thing”, and even that he was a vegetarian. You might have even seen pictures of his grave in Fort Wayne, Indiana. Trouble is, even though he did travel in Indiana, Ohio and Pennsylvania planting apple trees, none of the above is true. His real name was John Chapman, and he was born on September 26, 1774 in Leominster, MA, just as resentment against England was growing to a fever pitch. His father, Nathaniel Chapman, was a Minuteman and fought under George Washington in the Revolutionary War. Little is known about his childhood, except that he spent some summers with his uncle (from his mother’s side), Thomas Mann. Thomas’ daughter (and John’s cousin) Betsey would later marry Sam Wilson, a meatpacker who supplied barrels of meat stamped with a large “US” on the side to the Army. When asked what “US” stood for, he once replied “Uncle Sam” – a nickname for the federal government to this day. Far from being a poor hobo, John was actually a wealthy business person. He understood that apples were a valuable, durable food for settlers, and saw this as a business opportunity. He would travel along well-worn settler’s paths, buying land plots and starting orchards along the way. He usually charged for the trees he started from seed, but would often accept goods in trade instead of money if the purchaser didn’t have it at the time. He was, however, a charitable man, and often used his money in support of his faith – a Christian sect known as the Swedenborgians. John’s birth certificate from 1774. Often the trees available from more established nurseries were better than what John offered, but John’s advantage was “location, location, location”. He would strategically place his nurseries to cater to passing settlers. John’s travels, then, were really to move from place to place to tend his orchards. He could do this best by traveling light – which is what made him seem like just a hobo to many people. When he could, he would actually stay at the homes of friends and other members of the Swedenborgian faith. Despite reports he had visited Abe Lincoln in Illinois, Fort Wayne is the farthest west where records show he had purchased any land. By 1836 he had moved his home to Fort Wayne, at the edge of settlement of the Indiana Territory. In early March he heard that cattle had broken through the fences in one of his orchards miles away. He set out to repair it, but upon his return he was stricken with what was probably pneumonia, and spent his last night, March 12, 1845, at the home of William Worth. John Chapman’s memorial gravesite in Johnny Appleseed Park. City fathers located John’s grave along the St. Joseph River in Fort Wayne in the middle of “Johnny Appleseed Park”, where a giant festival is held every year in his honor. 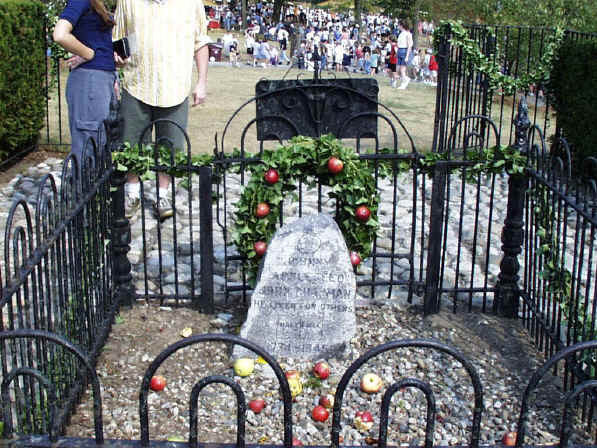 The gravestone reads “Johnny Appleseed (John Chapman). He lived for others. 1774-1845”. In an ironic final twist to the story, the official grave is actually just a memorial – John was really buried in an unmarked grave somewhere along the river bank in the park that bears his name. To this day the real site has never been found. It’s not my first time to visit this web page, i am browsing this website dailly and obtain fastidious data from here every day. …….so…..nothin more known than …general vicinity if final resemting place………I’m 55 …and…..Johnny…..has been my humble hero ..from a time when preschool was….nonexistent….I ve been there……rode bycycle nearly50 miles from inside OHio…..nobody d take me to research my friend….so does it teallllly. .matter where….anyone is buried????? ?